^ Italie, Hillel. New Dan Brown novel coming in September. Associated Press. 2009-04-20 [2009-04-20]. （原始内容存档于2009-04-24）. ^ 2.0 2.1 Carbone, Gina. Dan Brown announces new book, 'The Lost Symbol'. Boston Herald. 2009-04-20 [2009-04-20]. ^ Report: Dan Brown has finished his book. Seacoastonlone.com. [2009-02-12]. ^ Dan Brown is ready with new book (Swedish: Dan Brown klar med ny bok). E24 Lifestyle. 2009-02-13 [2009-02-13]. ^ Keys to Dan Brown's Solomon Key. [2008-12-20]. ^ Neill, Graeme. Random House announces Dan Brown date. The Bookseller. 2009-04-20 [2009-04-20]. （原始内容存档于2009-04-23）. ^ A New World: Scheduling E-Books. New York Times. 2009-07-15 [2009-07-15]. ^ Dan Brown moves to Washington for new thriller. Reuters. 2009-07-08 [2009-07-15]. ^ The Lost Symbol eBook（Kindle Version）. Amazon.com. 2009-08-17 [2009-08-19]. 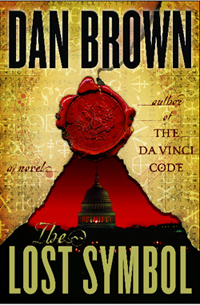 ^ Dan Brown returns with Da Vinci Code sequel, The Lost Symbol. The Guardian. 2009-01-20 [2009-04-20]. ^ New Dan Brown book offers industry hope. The Sydney Morning Herald. 2009-04-21 [2009-04-21]. ^ Columbia moves on 'Symbol'. Variety.com. 2009-04-20 [2009-09-01].